Hosta Royal Standard was the first patented Hosta which was introduced in 1965. 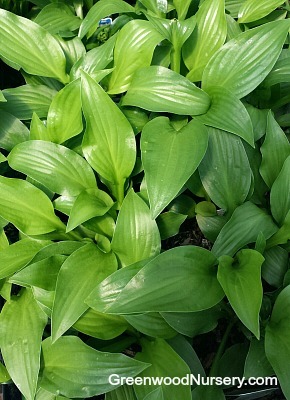 The Royal Standard Hosta plant has deep green foliage and grows to 24 inches in height with a 30 inch spread. Perhaps Hosta Royal Standard's greatest quality is the highly fragrant funnel shaped white flowers that bloom from July through August. This plant is hardy as well, growing from heavy sunlight to heavy shade and in a variety of soil conditions. Of course the best performance of the Hosta Royal Standard will be seen in early morning sun with afternoon shade where it will flourish.